The Flash-10 DAD 400, Flash-10 DAD 600 and Flash-10 DAD 800 are UV-Vis diode array detectors that measure absorbance of four wavelengths simultaneously in one cell. More wavelengths are used in liquid chromatography to verify purity of analyzed samples or in situations in which some peaks absorb on different wavelengths. 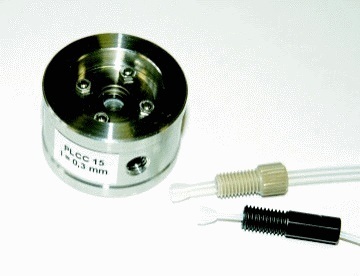 Flow cells are available for preparative HPLC and flash chromatography or analytical HPLC applications, and with an optional adaptor (and changed sensitivity of CCD element at time of manufacture) external cells can be connected by optical cables with SMA connectors. 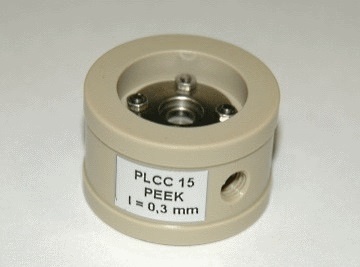 Preparative Cell PLCC 15 is supplied with each unit, for a maximum flow rate of 500 mL/min. 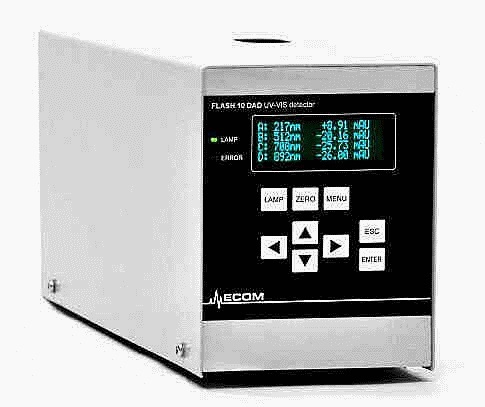 The detectors can be controlled manually by keyboard and display or with a PC using an RS232 serial port. Output signals are available in analog and digital form. Inquire about versions of the DAD detectors without display and key-pad for sole control through the RS-232 port and software such as Clarity and ECOMAC. The Flash-10 DAD detectors can be used with any existing components but can also be used with the Spider C06 Fraction Collector and Injector supplied by Rose Scientific.